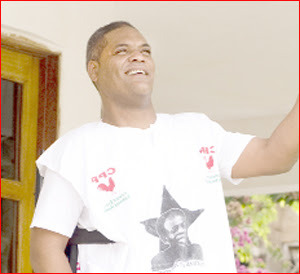 Former General Secretary of the Convention People’s Party (CPP), Ivor Kobina Greenstreet, pulled a major surprise over the weekend when he beat three others, including favourite Samia Yaaba Nkrumah, to become the party’s flagbearer for the 2016 general election. He has been elevated from the General Secretary position to presidential candidate. With his election, he will have to contend with the New Patriotic Party’s (NPP’s) Nana Addo Dankwa Akufo-Addo and the incumbent National Democratic Congress’ (NDC’s) John Mahama in the November elections. Ivor polled an overwhelming 1,288 votes, representing 64.7 percent of the 2,006 total votes cast, while Samia had 579, representing 29 percent, followed by new face Joseph Agyapong and Bright Akwetey, who together polled less than 10% with 83 and 42 votes respectively at a congress held at the Trade Fair Site, La in Accra. Samia has since been crying foul, claiming Greenstreet bribed his way through to be elected to the position by doling out cash ranging between GH¢200 and GH¢500. Moments after being declared winner, Mr Greenstreet, a lawyer by profession, indicated his preparedness to work with his three other contenders to ensure a united front, going into the 2016 general election. “We will emerge united. There are going to be no divisions and I will do everything in my power… Samia Nkrumah is my sister, Bright is my brother, Joe Agyapong is also my brother; we will work together and you will hear from us in our discussions with our colleagues about our theme for our campaign because in CPP we work as a team,” were his exact words. Going forward, he said, the CPP would serve as a vehicle for frustrated Ghanaians who are tired of the “bogus and empty promises” of the Mahama-led National Democratic Congress administration. Despite earlier caution by the party’s National Chairman, Professor Edmund Delle, against unfounded allegations and character assassination by the aspirants, Samia Yaaba Nkrumah, immediate past Chairperson of the CPP and daughter of Ghana’s first president, told journalists that Mr Ivor Greenstreet engaged in vote buying. “I’m obviously not happy with the results, but I accept them. The fact of the matter is that every delegate was paid GH¢200 and GH¢500 actually, amongst many other things. So, it was down to money and of course, we cannot be happy about that,” she alleged. CPP leading member Professor Agyemang Badu Akosa also believes delegates voted for money. Prof Akosa, who tipped Samia to win with more than 80 percent of votes, expressed his disappointment with the delegates after the results were declared. He said it was sad that delegates decided to sell their votes.